Chances are you live a fast-paced life or deal with a lot of stress. Stress is a normal part of life but too much can be dangerous for your health.Â A great amount of stress can weaken your immune system, fill you with rage, and make you a victim of anxiety. Anxiety is a source of fear. Life is pretty stressful and some anxiety is not a bad thing for most people. But when it gets overwhelming it can become a problem that might affect your mood, health, and even prevent you from doing everyday things. Stress that’s not dealt with correctly can lead to chronic stress, which will definitely take a toll on your body and overall health. Sometimes you just have to stop worrying about the world and take a moment to breathe. Take 5 minutes a day to close your eyes, inhale deep through your nose and exhale through your mouth. Deep breaths send oxygen to your brain and cause a relaxed feeling throughout your body. Find someone you feel comfortable talking with whether it’s a family member, a friend or life partner and just let it all out. Sometimes talking about whatever your source of stress is can be enough to stop worrying and move past it. Sometimes people hate sharing their worries or fears with others so they hire someone to listen, that’s why therapists are still in business. Meditation is pretty much a way to stop concentrating so much about everyday situations you can’t control and let positive energy flow through your body. It takes great practice to completely clear your mind and let energy flow, but there’s many websites and resources to help you out. Yoga is also great technique to help with breathing and concentration. 4. Go for a run. Exercise helps reduce your blood pressure, which can become elevated with overwhelming stress. Your heart is a muscle, when you workout your heart needs to pump blood faster to help increase your oxygen intake. 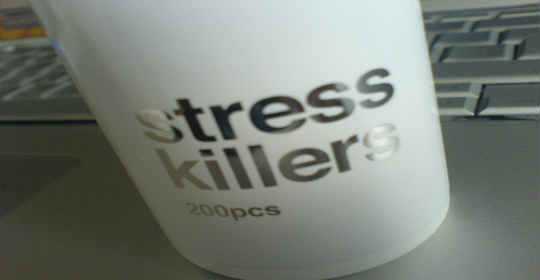 Not eating too much sugar and processed food can also help reduce stress.